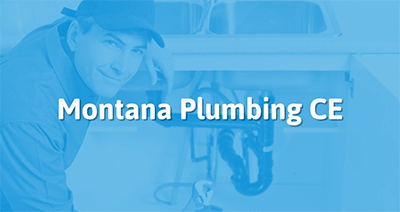 All of our courses available for Montana are approved by the Montana Board of Plumbers. Take the continuing education to renew your MT plumbers license today. All of our courses can be completed At Your Pace Online to help you meet the state's requirements to maintain your license. Once you finish your class you will have an official certificate of completion to save for your records, and we will report your course completion to the state for you. Licensed Journeyman and Master plumbers are required to accumulate 4 hours of Board-approved continuing education annually. All licensed plumbers must complete their continuing education by September 1st, every year. Each change is discussed by presenting the language that was deleted, changed, or added, and providing the reason behind the change. This course fulfills the required four hours of continuing education for licensed plumbers in Montana, focusing on changes to the first 8 chapters of the 2012 Uniform Plumbing Code after its revision from the 2009 edition. Each change is discussed by presenting in clear terms the language that was deleted, changed, or added, and providing the reason behind the change. This course fulfills the required four hours of continuing education for licensed plumbers in Montana, focusing on changes to the final 8 chapters of the 2012 Uniform Plumbing Code after its revision from the 2009 edition. In place of Chapter 12 of the UPC, changes to the 2012 International Fuel Gas Code (IFGC) are covered.